CZECHOSLOVAKIA, republic in Central Europe. Founded in 1918, it united within its political framework the Jewries of the "historic countries" (*Bohemia, *Moravia, and part of *Silesia), connected with the *Hapsburg Empire from 1526 and under its direct control from 1620, and of *Slovakia and Carpatho-Russia (see *Sub-Carpathian Ruthenia), both an integral part of *Hungary, from the tenth century. As of January 1, 1993, Czechoslovakia ceased to exist as a separate entity and its territory became two independent nations, the *Czech Republic and Slovakia. The Jewish communities of the various regions hence differed substantially in their demographic, economic, and cultural aspects, with influences of assimilation to the Czech and German cultures prevailing in the west, and the Hungarian in conjunction with the traditional Orthodox Jewish way of life in the east. 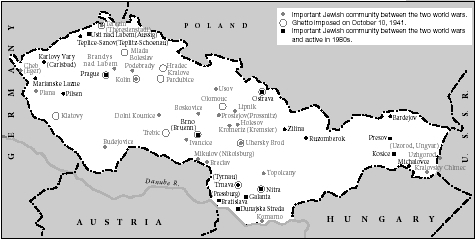 Major Jewish communities in Czechoslovakia from World War I to the 1980s (including involuntary settlement-ghettos as of October 1941). Adherents of the Jewish religion in 1930 represented 2.4% of the total population, and Jews by nationality 1.3% of the total. While in general mother tongue served as the criterion for nationality, Jews could declare Jewish nationality irrespective of it: 156 persons who were not Jewish by religion declared their nationality to be Jewish in 1921, and 317 in 1930. After 1918 five regional federations of communities existed in Bohemia-Moravia; in 1926 they established the Nejvyšší rada židovských náboženských obcí (Supreme Council of the Jewish Religious Communities). It was first headed by the Czech-Jewish leader Augustin Stein and then by Joseph *Popper. The chief rabbi of Prague (then Hayyim Heinrich *Brody) was an ex officio member. In Slovakia and Carpatho-Russia, as in Hungary, three trends of community affiliation existed. The orthodox communities of Slovakia had an autonomous organization (confirmed in 1920) which from 1923 also included those of Carpatho-Russia. Its statute limited the franchise to dues payers. The *neologist and *status-quoante communities amalgamated into the Jeshurun federation in 1928. There was no supreme communal organization or chief rabbinate. From 1926 the salary of rabbis was augmented by the Kongrua, a government fund for the upkeep of religious life.